There are several spoilers in this review of The Hunger Games, and I’ll get them out of the way early. The film shows precious little hunger and no sense of game. It’s a terrible movie, but it grossed $68.25 million on its first Friday. So that’s where your teenage daughters were over the weekend—or what they told you. And that’s why film critics sometimes feel their own futility. I know, or I have heard, that the series of books by Suzanne Collins, of which The Hunger Games was the first, have sold all over the world in amazing numbers since 2008. I am amazed and daunted, and I might have tried reading one of them if the movie had suggested anything perverse or interesting. Even now, I can see that the plot motif, of teenagers in a contest where they must kill one another, might threaten sentimental ideas of what children are or ought to be. But the only way this movie takes on that issue is to disguise it, in case it interferes with the commercial inevitability that came to fruition on that first Friday (known at Lionsgate, the film’s distributor, as Good Friday). The film places us in a post-apocalyptic world, though there is no sign of how the end came and no trace of a toxic aftermath. So the apocalypse is just a pretext for a peasant community lorded over by an eccentric super race and their police force. The rulers have whatever technologies the script needs; the ordinary people have very little, except bread, humble virtue (as in silent cinema), and waiting for the lottery. Every year, the ruling class put on a show: Teenagers from the twelve districts are selected at random to engage in mortal combat. Only one will survive. 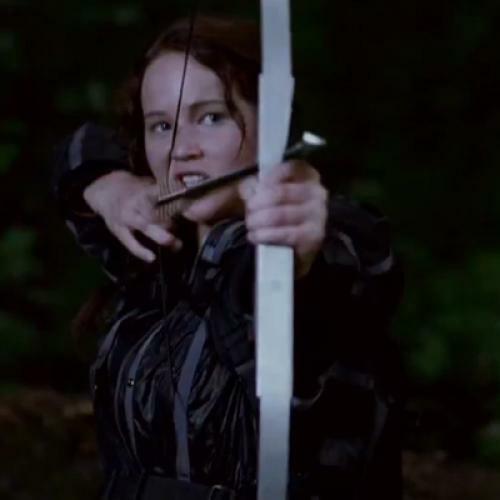 Katniss Everdeen (the names do seem to have been affected by fall-out) becomes one of the contestants when she volunteers to take the place of her younger sister in the Games. I gather that in the book Katniss is 16, but here she is played by Jennifer Lawrence, who is 21. A couple of years ago, this actress was the lead in Winter’s Bone, and just a year ago she did a good job in The Beaver. There were teenage girls at the Hunger Games screening I saw who were in raptures over the movie Katniss, but I’m disappointed. Lawrence has great ability, and the publicity says she got in shape for this adventurous role. Still, she looks as well-fed or un-hungry as a star player on the UCLA water-polo team, and as placid or chlorinated. This could be a great role: a kid fighting for her life, meeting her first love, and trying to survive in the woods (they shot in North Carolina). The film should have suspense, fear, and desperation, all focused on Katniss, but Lawrence seems reserved and biding her time—she has signed on for all four films in the series, and her rewards must be stupendous. I hope she won’t forget that in Winter’s Bone, where she probably had little more than per diem money, she got an Oscar nomination for a portrait of rural courage and persistence. If you want a bold, dangerous young woman who can look after herself (and it’s easy to understand that role model appealing to our daughters), I’d still go for Rooney Mara as Lizbeth Salander. The handicaps reach further. Before I saw The Hunger Games I had to watch a trailer for The Hobbit (coming at Christmas), and it’s clear that this return to Tolkien is going to indulge Peter Jackson’s eye for the romantic grandeur of wild New Zealand scenery. The forest is the essential setting for The Hunger Games and there is a lot of tracking through the trees. But it’s drab, a cheesy and unimaginative landscape compared with Jackson’s work or Michael Mann’s vision of the outdoors in The Last of the Mohicans. Katniss climbs trees to escape from marauders, but we seldom feel we’re in trees, and there’s very little animal life. But the greatest shortcoming is in the matter of combat. Whether the filmmakers like it or not, this is a story about kids killing other kids with knives, bows and arrows, and anything else they can get their hands on. If you don’t like that violence, and if you fear it will jeopardize the box office, then don’t do the story. Instead, the woeful director Gary Ross has elected to present the combat as a mess of trembling hand-held close-ups, rapid cuts, and an overall blurring, so that in effect we don’t see the action. To my mind this is nearly un-American: From Ford and Hawks, through Sam Fuller and Anthony Mann, to Coppola and Scorsese, our cinema has reveled in what is called “action” and made it something close to a philosophy. But in The Hunger Games you feel these scenes are like ink smudged in the rain. Perhaps it was calculated to get a PG-13 rating; perhaps Ross is a chump as a director (he made a similar hash of Seabiscuit); perhaps the script, by Ross, Suzanne Collins, and Billy Ray (who wrote Shattered Glass) never settled on the level of terror or savagery it was trying for. $68.25 million in a day is not going to persuade them to try harder on three more films. I grieve for Jennifer Lawrence to think that vital years will be given over to the drivel of this franchise. It is sad to see Woody Harrelson in a role that need not exist, when he is becoming an odd and compelling actor. Donald Sutherland’s portentous mastermind figure is as hollow and predictable as his other work in recent years. The only person I want to see again is Stanley Tucci, who is witty, exact, and wicked as a blue-haired commentator to the games—they are a television entertainment, of course, a reality show. Tucci is a treasure as an actor. If he’s in a film for a minute, you want to see it. He is also a very good director (Joe Gould’s Secret), and I wish he had the freedom or the resources to do more things like that. No one begrudges films that make more money than sense. There have always been such wonders on the screen—like Lawrence of Arabia, Jaws, and Star Wars. American films are crying out for pictures with authenticity, screen originality, and unquestioned public appeal. Occasionally such a film shows up: Inception, Toy Story 3, and True Grit. The phenomenon of The Hunger Games is depressing just because you can’t feel its $90 million on the screen, yet we’re overwhelmed by the gold rush of its revenue. The latest news—$155 million on the first weekend—is like a Goldman Sachs number: unreliable, subject to change, and all publicity.